RESTORING OLIVIA: Welcome! How about a front row seat witnessing a miracle? Welcome! How about a front row seat witnessing a miracle? Things can change quickly when you are finally on a correct path. For Olivia, this new path is seizure control with LeafLine Lab's Cobalt Medicinal Cannabis. What do you think of the welcome picture? 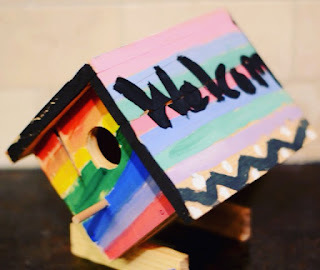 Although it may appear to be like any other kid painted, run of the mill birdhouse, this particular one is inspirational to me. They were assembled a couple weeks ago.....on a sunny fall day by Lauren, her friend and I. Tim the Toolman's instructions were simple, but my anxious mind misread an elementary step in the very beginning which resulted in a complete tear out and rebuild. I never realized how much time it could take to pull out 20 nails and re-hammer them until I had to. But this is what a mom does. We take an extra couple hours of our day to fix our mistake - tear filled eyes are too much to bear. This verse has really weighed heavy on my mind lately ---- one of the key verses in the bible about worrying - and why NOT to do it. I guess my years of perfecting this shameful practice isn't something to be proud of. Seriously though, several months ago a friend who was struggling said, "Oh --- hey, I thought of you and the bible today. I looked out the window and saw a dead bird lying on the ground ---- isn't there a bible verse that says that God will feed and take care of them? Guess he forgot about that one. He froze and died right outside my window." I thought of this interaction one morning while I was in the kitchen, gearing up to make breakfast for my family and I heard a "ping, ping ping" on the family room window. I looked out and saw a robin sitting in the evergreen looking right at me. Within minutes it took flight and smacked its beak into the glass, bounced off and retreated to the original position in the tree. I turned around and thought to my self, "hmmm.....that should be the end of that - it hit the glass, felt the pain, he won't be bothering us again." WRONG. It was just the beginning of a week long period of the bird not just hitting the window once, or twice or three times a day - the obsessed creature banged and banged over and over all day for 7+ days. We tried several things to derail her. We bought some helium balloons and hung them in front of the window, we put up a scarecrow, we lined the window with paper......etc etc. At one point she was hitting the window every few minutes for hours. It was in this moment that I thought of my friend and his dead bird. The creature that lay just outside his window for him to see and pose the question about God not being there for him - especially when the bible says He feeds and takes care of them all. It made me think ------ maybe his feather friend wasn't old --- maybe he was just banging and banging on the window, trying to get in a place that wasn't for him and he was so stubborn and couldn't give up and finally ended up hurting himself. He could have been so focused on what wasn't for him that he couldn't turn around and see the food and twigs that God may have had for him ----- say ---- across the parking lot. But this one. This birdhouse was designed and painted by my beautiful girl while I was inside sitting on the couch tending to my heavily beaten fingers. Her choice in design is for me, for Olivia, for our journey. It is not a mistake that the entire front is a rainbow of colors, and the "welcom" (she ran out of room) is meant for this post ---- an invitation to you to follow this rainbow designed appointment by God -- just for this point in time.... for her sister. This rainbow on the front is the perfect size to cover my broken heart and is interpreted by me as God's promise. His promise that His will for Olivia is beginning to unfold, just as the rainbow for Noah was a promise for us all. It takes a long time for some pensioners to learn that delays are not denials. Ah, there are secrets of love and wisdom in the "Delayed Blessings Department," which are little dreamt of! Men would pluck their mercies green when the Lord would have them ripe. "Therefore will the Lord WAIT, that He may be gracious unto you" (Isa. 30:18). He is watching in the hard places and will not allow one trial too many; He will let the dross be consumed, and then He will come gloriously to your help. I hope my journey to faith over the last 15 years will prove inspirational. Frankly, there is no logical reason why I retained it --- we had many rough years. Believe me, during those so called logical (or is it illogical) years I begged and pleaded for peace in accepting her as she was. That peace never came....peace only came while meditating on her healing, it appeared that God wasn't going to allow me to give up. I am so happy you are following our journey! Please feel free to share this blog address with anyone you think would enjoy having a front row seat to a miracle in the making! We are blessed with your company and hope to bless you with each and every post! Oh, I love this so much! The rainbow comes after the storm. A storm we still remember with wet grass beneath still beneath our feet. But the beauty before us unmistakable.